Boy, how time flies. In September, it will be an entire year since Hyundai rolled out the ever-so-unky Veloster. While the quirky three-door has been met with strong sales and an even stronger following, it’s also been met with some glaring gripes, with the general consensus being that the Veloster lacks the requisite powertrain punch a car of its ilk should possess. Nevertheless, demand for the Veloster has been overwhelmingly high — the days-to-turn rate of the Veloster is one of the lowest in its segment at 12 — though it would appear the Korean automaker isn’t about to rest on its laurels. Instead, it’s been busy readying a beefed-up Turbo version of the uniquely styled three-door coupe. Last week we were invited to California, where we had the chance to put the 2013 Veloster Turbo through its paces amid the desert hills and serpentine roads of sunny San Diego. We left fairly impressed, but before we offer up our initial impressions, here’s an overview of the 2013 Veloster Turbo to bring you up to speed. Engineering a car that looks great is no easy task. Engineering a car that simply stands out from the crowd is decidedly easier. While the 2013 Veloster Turbo easily accomplishes the latter, its more eccentric styling will not please everyone. But it doesn’t have to, and that is exactly what Hyundai execs were keen to hammer home during the car’s press presentation. According to Brandon Ramirez, Hyundai’s Senior Group Manager of Product Planning, the Veloster is meant to act as a “reverse halo” for the Korean brand. With both Gen Y- and Gen X-ers in its crosshairs, Hyundai wants the Veloster to be that gateway to the brand’s more contemporary vehicles, and to compete with the likes of the Civic Si, Beetle Turbo, Volkswagen GTI, and Fiat 500 Abarth. And for the most part, we see it working. This car is clearly aimed at a more youthful demographic, and so it should be. Visually it’s unlike anything else Hyundai has on offer. Once you see one marauding down the highway you won’t forget it. Even from the outset, we liked the standard Veloster’s stylings. So while we appreciate the engine tweaks (more on that in a minute) we were never going to be satisfied with a simple retooling of the Veloster’s design. Thankfully, Hyundai has supplied just enough additions to Turbo’s exterior in order to help it stand out. On top of a unique bodykit, some of the more stand-out exclusive exterior style cues to the Veloster Turbo include a unique fascia, grille, bumper, projector headlights with LED accents, and upgraded 18-inch alloy wheels with chrome highlights. Around the back, the Veloster Turbo features vibrant LED taillights along with a unique rear bumper that houses two large round dual exhaust tips giving the Veloster an even sportier vibe. While the car’s exterior design will certainly divide opinions, the interior is far less polarizing. Modern cars have a tendency to resemble high-tech command centers and the Veloster Turbo is no different. Control buttons flank each side of the steering wheel, while a sharp electroluminescent gauge cluster compliments the center console’s 7-inch multimedia touchscreen. Smaller touches, like alloy wheels, a proximity key with push-button start, and black leather seats with gray or blue stitching, help lend a blank and cutting edge feel to the Veloster Turbo’s interior. Hyundai tells us the turbo-fed Veloster features class-leading space, and on paper it’s impressive. In application, however, those large numbers have trouble translating to the real world. Space up front for driver and passenger is more than enough. But as with most coupes, rear passengers will suffer. Still, the Veloster Turbo does offer a surprisingly ample amount of space given the car’s dimensions. That third door certainly makes getting in and out a breezier task than the two door variety. And the car’s rear-seat cup holders are a welcomed feature. The standard Veloster features a straight inline four 1.6-liter engine capable of producing 138 hp and 123 lb-ft of torque at 4,850 rpm. With the Veloster Turbo, Hyundai has upped the ante with the automaker’s very first 1.6-liter turbo four-cylinder delivering 201 hp and 195 lb-ft of torque at 1750 rpm. 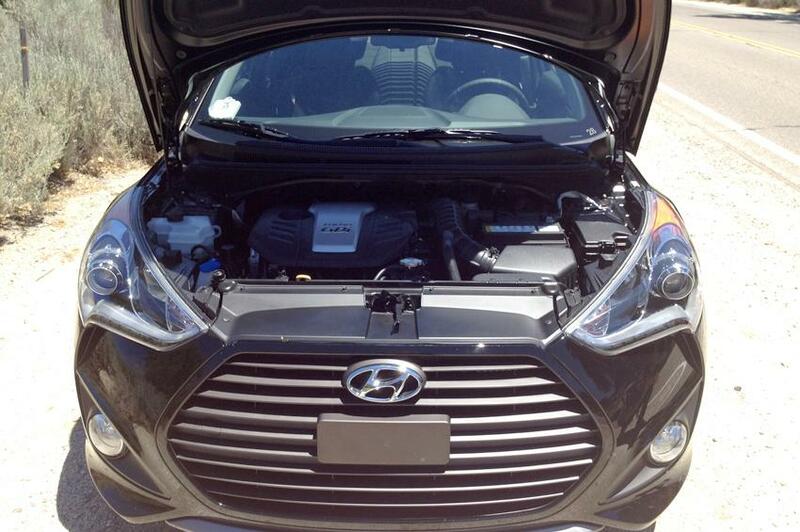 Now, it’s no secret that the standard Veloster engine was a real let down. Hyundai has moved to rectify this with the Turbo version. But while the spec numbers make it seem rather impressive, we felt disappointed by the car’s acceleration and speed. Power seems to peak early in the rev line. And while we’re not going to question adding a turbo, when comparing the pick and up go power to, say, the 2012 Beetle Turbo, the Veloster Turbo feels frail. The Veloster Turbo makes up for the lack of fierceness in its powertrain with stellar fuel economy. EPA ratings for the 6-speed manual sit at 26 mpg in the city, 38 highway, and 30 combined, while the 6-speed automatic will net 25 in the city, 34 on the highway, and 29 combined. Hyundai wanted to develop a fun-to-drive, sporty hatchback — and thankfully, in that regard, the Veloster Turbo delivers. 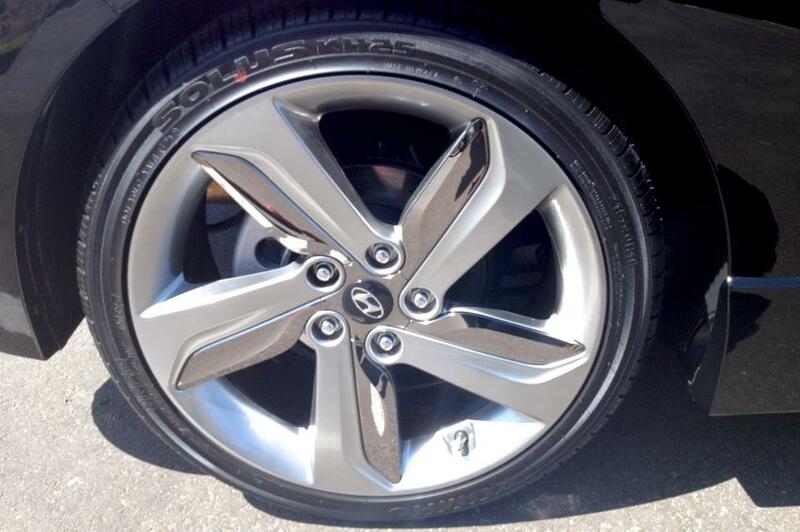 Handling is capable, and entering sharper turns was never a problem. 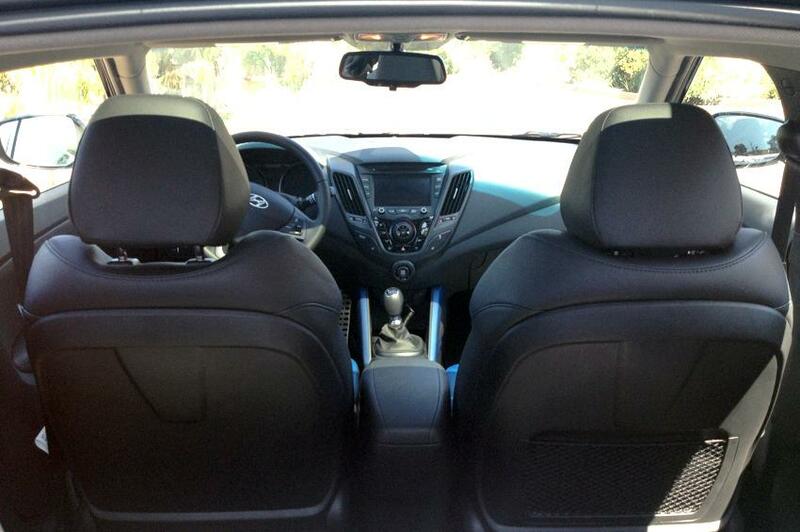 The Veloster Turbo does an excellent job of keeping itself centered and maintaining a positive grip on the road. We did find ourselves being tossed about during some of the more demanding turns, but generally cabin sway remained minimal. 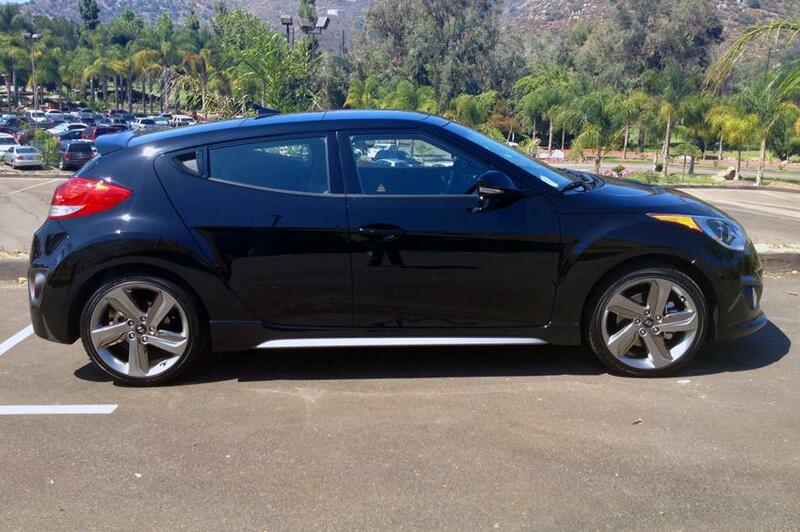 Like the Elantra Coupe and Elantra GT, the 2013 Veloster Turbo keeps trim levels sweet and simple. Base price starts at $21,950 with a six-speed manual transmission. Upgrading to a six-speed automatic with paddle shifters will see that price rise by $1,000. The Veloster Turbo carries over a lot of content from the standard Veloster, while adding unique features such as 18-inch alloy wheels, LED accents on the front headlights, and a Hyundai-first matte gray paint option. Potential buyers can opt for the Ultimate Package, which adds a panoramic sunroof, backup warning sensors, and a vivid 7-inch multimedia touchscreen navigation system with rearview camera integration for $2,500 more. Altogether, a full-loaded 2013 Veloster Turbo with automatic transmission will set you back $25,450 (excluding freight). In the end, the Veloster Turbo is the type of car that begs to be driven, but what type of driving that will entail largely depends on the owner. Despite Hyundai’s best efforts, the Veloster Turbo doesn’t really excel at one thing in particular. Instead, it has a multitude of traits that make it a solid performer, and maybe even a cut above average. While we can get behind the car’s dynamic design, tech-packed cabin, and frugal fuel economy, we can’t help but feel Hyundai failed to deliver on what the car seems truly destined for: going fast and attaining loftier, much sportier heights. But perhaps that’s what the Genesis Coupe is for. 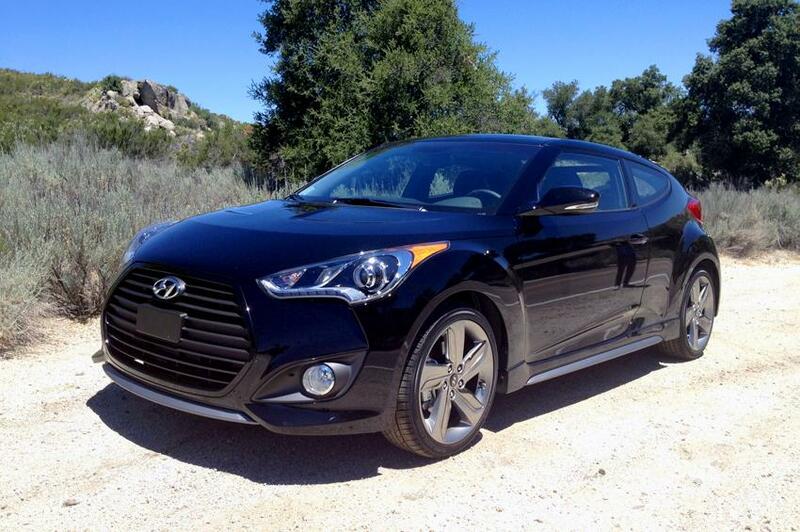 Nevertheless, the Veloster Turbo represents a strong, if not bold showing from Hyundai. Not everyone will be impressed by its eccentric stylings, though, and even less so with its limited powertrain. But what it lacks in performance it more than makes up for with its loud personality, strong fuel economy, and overall fun-to-drive character.